Chaise Chaude in French means "Hot Seat". 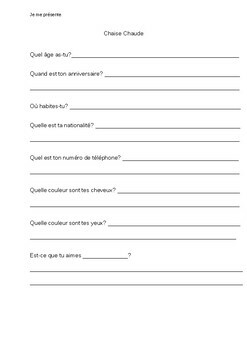 For this activity I give each student this sheet and they must fill it out and practice saying their responses with a partner daily. Then we have a "Chaise Chaude Day", where all students have a turn sitting in the Chaise Chaude (I use a special chair) and they will be asked 3 questions from the sheet by classmates. I use this as an assessment for spontaneous speaking in French and responding to questions.